The Annual General Meeting was…..
Not an altogether usual heading for an AGM but it won’t be remembered for formality and to-the-point discussions of intense nature. EFG members travelled from all over the country, a lot of issues were sorted and quite a bit of laughing done. The Glen of Imaal Terrier Enthusiasts & Fanciers Club now has an official (no more Acting) Committee and Officers. There are approved accounts and rules. The judging list-a work in progress-is up and running. Health monitoring discussed with great enthusiasm. A Judges Seminar will be organised for the Autumn. Heck, this blog even got talked about along with other ideas that the Committee will be working on over the coming months. We promise more Jaffa Cakes next year! Entries for the first EFG Open Show close this weekend. The Schedule is online or one can be obtained by post from Jean Rogers, Hedge Green Cottage, Blackjack Road, Swineshead, Boston. PE20 3HH. There are rosettes galore to be won and that old fashioned thing of money will also be taken home by a lucky few. Stain glass Glens from America, the only ones in the country (we believe), will make a couple of exhibitors very happy. Royal Canin have been very generous with their sponsorship and we thank them for their individual class “goodies” as well as larger bags of food for Best In Show, Reserve Best In Show, Best Puppy In Show and Best Veteran. The show is being held in conjunction with Birmingham Gundog & Terrier so will give a great opportunity to do two shows, with two different judges, for only one lot of travelling expenses. Their schedule is also online and yes the date of the show is Easter Sunday so just think of the Easter eggs that might be donated…..hint, hint if anybody would like to follow that up talk to Jean! Ryton-On-Dunsmore is a very central location and easily accessible off the motorway from any direction. Glen of Imaal Terriers continue to show the breed in the exhibition ring. 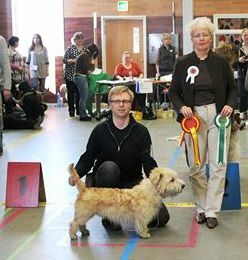 In Finland at the Jamijarvi Group Show Glenrosedale Ardal Ridire Ain Ri was Best of Breed. Over in the USA Ch Emerald Isle’s Keely with Daulton was BOB at Louisville and Glentyrs Lady Isabella at Castlerock was BOB at Fayetteville and Fort Lauderdale where she then took Group 3! 11.00 am on Sun 23rd March 2014 at Mappleborough Village Hall, Studley, B80 7BT. If you’re coming to the AGM tomorrow, I shall be bringing swab kits for the DNA archive at the AHT … £5.00 per kit. Please support this worthwhile project.